Prague is the capital of Czech Republic and most populated city in the country. Prague has a surprising number of vegan establishments for a city of its size (1.2 million). The city is probably best known for its old town and the beautiful Charles Bridge. Why You Should Go: The Czech Republic is a great place to visit for the beautiful architecture, the history and the food as well. Prague has a very unique look and thankfully was not bombed during WWII so there is a lot of incredible architecture to enjoy. Prague looks like no other city with buildings going back to medieval times and it is very clean too. Getting to Prague: Depending on where you are located you can fly into PRG airport. It is well connected to the city through public transit. You can either take a coach bus into the city centre or you can take the underground. Information at the airport should be able to help you find where to go. If you are already in Europe you can take a train or coach bus like Flixbus. Flixbus is a really good deal and they have wifi! How vegan friendly is it? There are cities out there with more vegan restaurants but this has to be one of the cities in Europe with the most vegan restaurants per capita. London and Berlin have tons of vegan restaurants but they are huge cities. 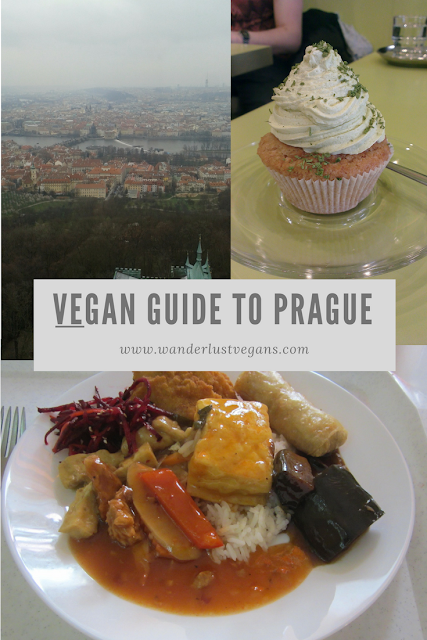 Prague is a city of 1.2 million people but Happy Cow lists 40 completely vegan restaurants in Prague and 81 if you include vegetarian. Can you believe that?! Loving Hut: This is the worldwide vegan chain run by Supreme Master Ching Hai. The food there is so good you might even consider becoming a follower of the Supreme Master. Regardless of whether you decide to follow her or not, you are free to go there and enjoy delicious vegan food. All the Loving Huts we've been too so far have been delicious. There is no standard menu for all the locations so you get something different at each one, which is pretty cool. Plevel: This place had some pretty tasty dishes and drinks. It's hard to go wrong with vegan pierogies. The prices were a little steep at this place compared to other places but still pretty reasonable compared to big cities like London. Puro (Veganz): We really enjoyed the sandwiches at this casual deli sort of place. They had bagel sandwiches! Their cut cakes were excellent and they had all sorts of vegan grocery items there as well. Clearhead restaurant or Lehka Hlava: This place was excellent and very reasonably priced. We enjoyed the atmosphere as well. They had some very unique decorations. The curries we had we very tasty. Etnosvet: We stopped at this place for lunch and could not recommend it more highly. The goulash we had was amazing. In fact, everything we had there was so fresh and tasty. You've got to check it out. Sight Seeing: There are a lot of sights that make a trip to Prague well worth it. You have to walk on medieval Charles Bridge, go inside Prague Castle, check out the Old Town square, see the astronomical clock, and go to the top of the Petřín Lookout Tower. Prague will not disappoint you whatever season you go. If you have time take a day trip out of Prague to the Sedlec Ossuary which is a creepy church made of human bones! Where to stay: We stayed in a hostel with a few of our friends when we visited Prague. That is a good budget option. Otherwise, you can try Airbnb or there are plenty of hotels available. Prague is fairly priced in terms of accommodation so you should be able to find something that works for you and your budget. Check out Prague's city guide for more information on their tourism. Have you been to Prague before? What is your favourite thing to see?